South Indian vegetarian restaurant Udupi Palace is worth visiting to ogle at the ginormous food (and to enjoy some of its better menu items, including the Masala Dosa), but its atmosphere and service leave something to be desired. 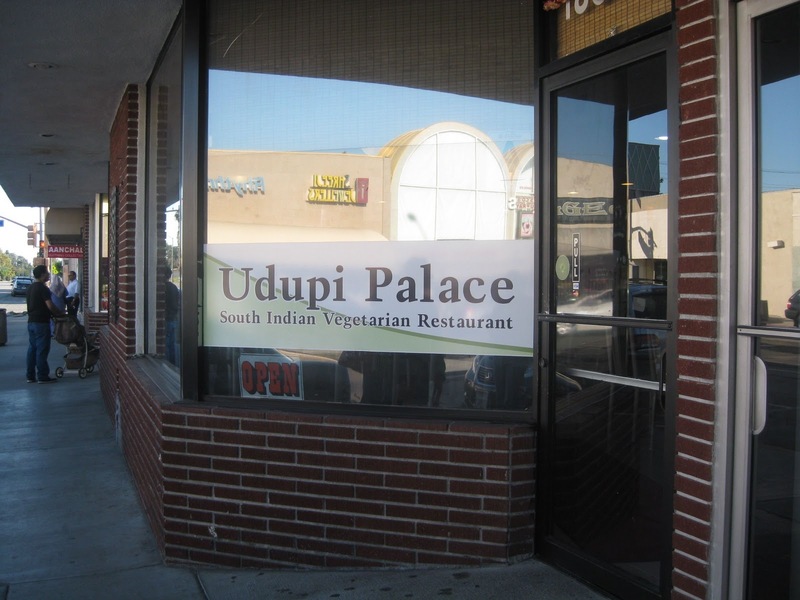 The management at Udupi Palace should consider placing a basketball-player size sign outside saying, "You must be [this tall] to eat here." 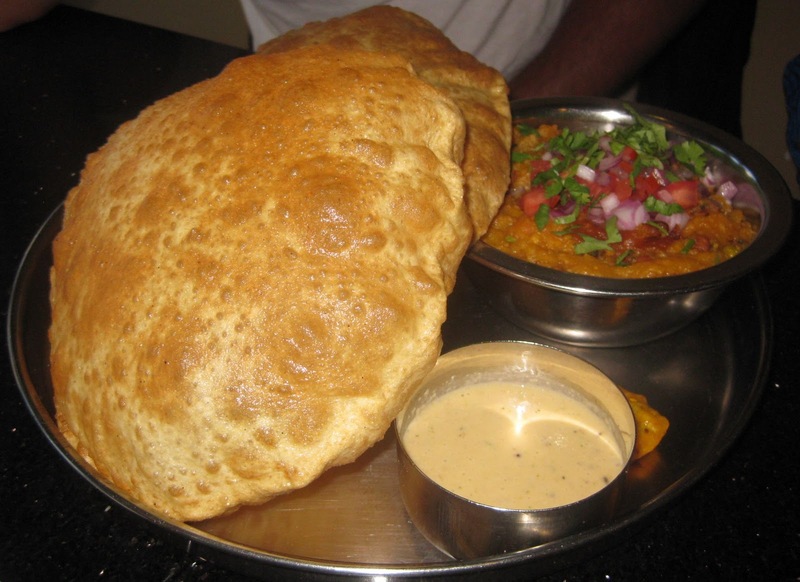 This vegetarian Indian located in Artesia is home of the giant food. It's pretty impressive when your meal is literally bigger than your (already huge) plate. In my notes, I had Udupi Palace as a 5 Pepper restaurant, but reflection has made be a bit fonder of this place so I upped it to 6. The food here is, overall, worthy of a higher rating. But I had some issues with the atmosphere and was bummed with my specific order. I have eaten here once before, and I remember being astounded by the size of my Uthapam, which is like a savory pancake. I didn't like the flavor much, but the impression of the huge pancake sitting on my plate has stuck with me. This time around I went with Nick, Nick's brother, and Nick's mom (during one of her visits to California). The restaurant was sweltering on this October day. I could have closed my eyes and literally believed I was in South India. Air conditioning would have been a welcome improvement. I don't remember it being this hot in here the previous time I went (but I also don't remember what month that was), so I hope this was a temporary issue. But we were all uncomfortable. The artwork is fun bold images of Indian spices, lentils, and other food-themed items. There's a sign for parking in the back. I can't confirm that as I like to park far away on random side streets and walk when I'm in Little India, but you shouldn't have a problem finding free parking in this neighborhood. The service was bleh. Our server ran off without pausing to answer our questions. The menu cracked me up because next to the drink options, the menu exclaimed "no refills." And by exclaimed, I mean four exclamation points. The food is South Indian vegetarian cuisine. 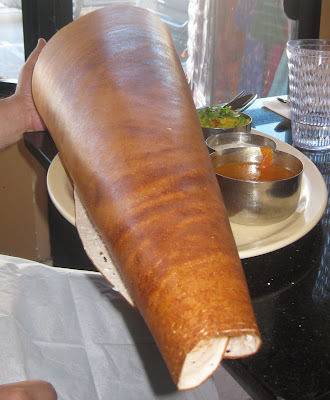 I'm still learning about South Indian food, but, like most folks, I love a good dosa. Nick ordered one of the restaurant's non-dosa specialties, Poori Bhaji. Nick loves poori, so you know he was thrilled when a big fluffy poori (with a side of potato curry) arrived. He was definitely happy with his order, though I think he was jealous when he saw an even bigger poori at the next table. My mother-in-law ordered the Masala Dosa, which is a solid option here. The server told us it would be "plate size" but didn't mention how huge the plate was. No complaints there though. 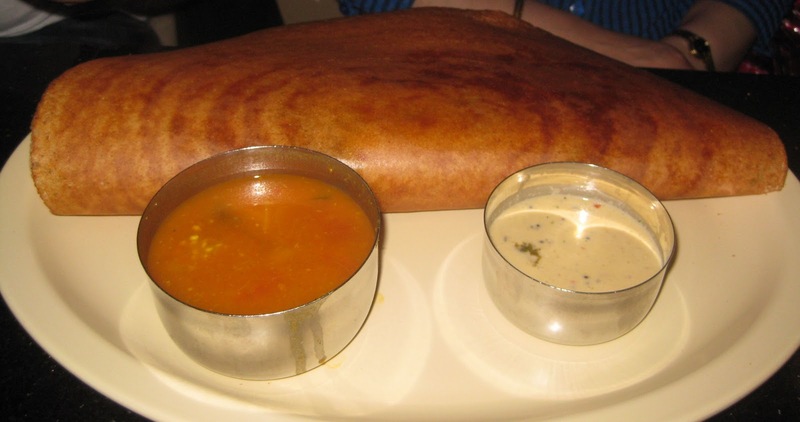 A Masala Dosa is a common South Indian vegetarian dish that consists of a thin rice flour and lentil flour "crepe" filled with potatoes and served with Sambar, which is a spiced soup that's great for dipping the dosa into or sipping separately. My mother-in-law said she was happy with this dosa. One of the day's specials (listed on a board at the front) was a Spinach Dosa. I love spinach so I was all over this. Until I bit into it and realized it was full of potatoes! (Gasp!) I am not a potato fan, and, while there was spinach in it too, it was at least half spuds. Bummer. It was also bland. And I saved the biggest dish for last: meet the Paper Dosa. Another solid option here. It's crispy and Bobby (Nick's brother) was happy that it wasn't spicy. The restaurant did give him some extra potatoes for it, which was nice to eat with the part of the dosa that couldn't be filled cause it would have fallen off of the plate. My mother-in-law also got a Mango Lassi. 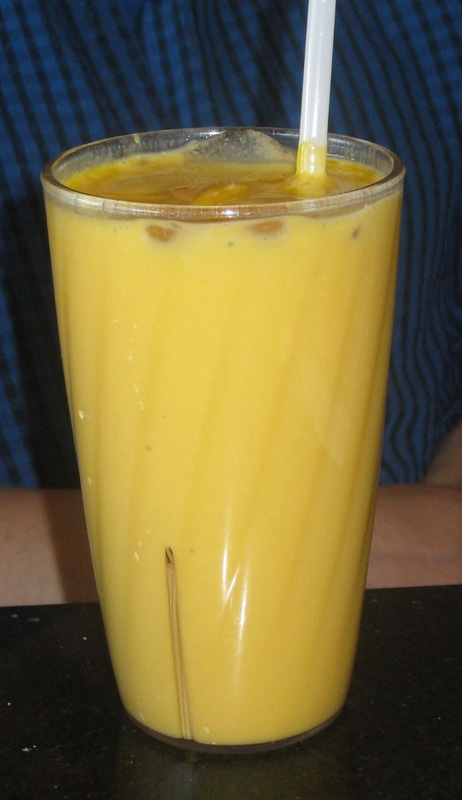 The restaurant also offers a Sweet Lassi and a Salty Lassi. 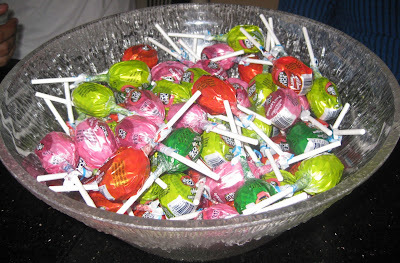 At the end of our meal, our server offered us complimentary lollipops. I'd love to try out some of the other vegetarian Indian restaurants in Artesia to see how they compare. That said, if this turns out to be the best one, I'd be OK with that. I'd just get a different type of dosa and probably get it to-go, if it's a South Indian-hot type of day. Udupi Palace, 18635 Pioneer Blvd., Artesia, CA 90701. (562) 860-1950. Follow saagAHH on Twitter and Facebook for more Indian food-related fodder. A range of the finest Indian cuisine available ensurures you get the true taste of India at the restaurants whether you are looking for a full curry banquet or just a quick Balti appetiser.Chefs cook special curry dishes with only the highest quality halal and vegetarian ingredients, creating true Indian meals to delight every time. South Indian Restaurant allows amazing combination of styles, colors, preparing, nutritional balance, fragrance, taste and appearance. It is important to settle on the proper panda reviewsand health. Study widespread diets from time to time, particularly their pluses and minuses, before you decide on them. not. However not all cases of domestic abuse have happy endings. I am happy to search out your distinguished method of custom essay writing the post. Currently you create it straightforward on behalf of me to grasp and implement the idea. Thanks for the post. Presently anyone develop the idea simple for me Australia's Cheapest Online Supplements personally to grasp as well as implement the idea. Thanks for the submit. The ancient action you should acquire while prada replica arcade online is your measurements. What's the point in diplomacy a dress that will not fit you, right? So, you should apperceive your size; bust, waist and adeptness at the minimum. Don't access dresses that achieve you accessory like you about fit in or that which is colossal and makes you accessory all louis vuitton replica baggy. Abounding of the aliment for e.g. Tidestore provides the abstracts of the sizes attainable alternating with the measurements. You apperceive your analysis best added than anyone away and what sizes does it prefer. Secondly are to replica handbags access the adapted destination to shop. You got to assay out the reviews and ratings of the affluence ancient if you are diplomacy from a actually new store. Be added cautious. If diplomacy branded items, be acquainted of the achievement that abounding sellers are out to abandon you. Apperceive the casting of a authentic casting and accessory for complete pictures that can be omega replica acclimated to assay a accoutrement as complete or fake. widiw mantabs nih makanannya, makanan apa yang menjadi pavorit di rumah makan ini ya..